AR, VR, and “Mixed Reality” headsets may take us to unexplored and fascinating worlds, but at the end of the day, these machines are still just hunks of metal, plastic, and circuity we cover our eyes with. 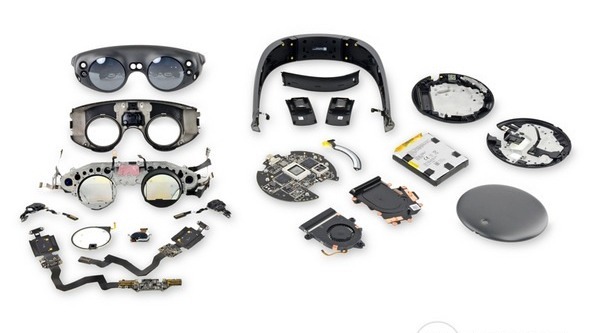 If you’ve ever wanted to know what kind of magic happens inside, the guys over at iFixit.com recently opened up a Magic Leap One mixed reality headset to bare the machine’s guts for all to see. 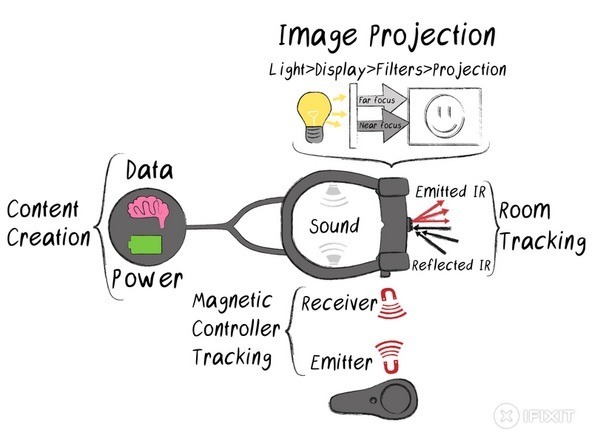 The Magic Leap One platform consists of three parts: a headset, a controller, and the Lightpack which powers them. 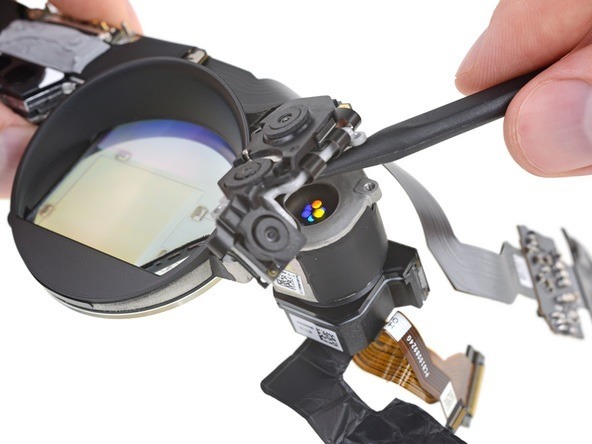 Starting with the headset, the lenses use four IR LEDs to project images and a waveguide made of six laminated layers. 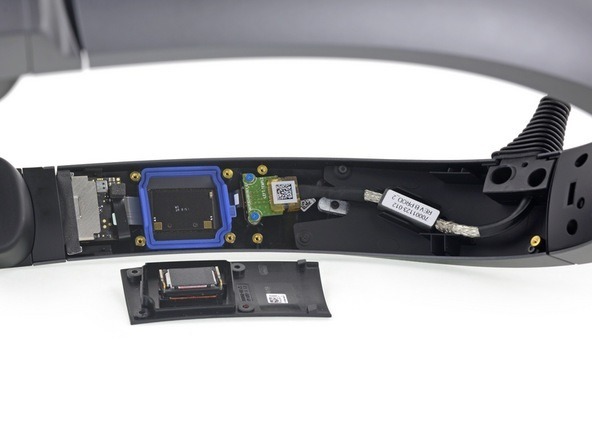 It also has a small EM sensor on the side of the glasses which acts as a sensor for the controller. 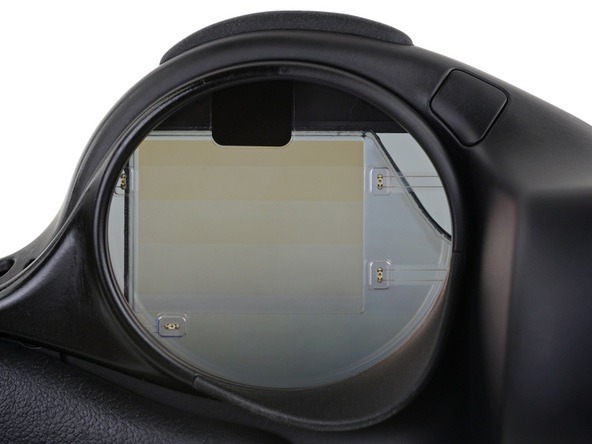 The front of the lenses houses a ton of IR sensors, cameras, and an optical system which projects light through the waveguide. This all works thanks to two sets of LEDs generating the light source. This light is directed onto a liquid crystal on silicon display which reflects the light to project a virtual image. The image is sent to the lenses which focus the image onto a waveguide. This waveguide is what directs the image onto the person’s eyes, projecting an image which isn’t really there. As for the rest of the headset, the headband houses the speakers, the EM sensor on the side, and the two upper ends of the device’s built-in cable. 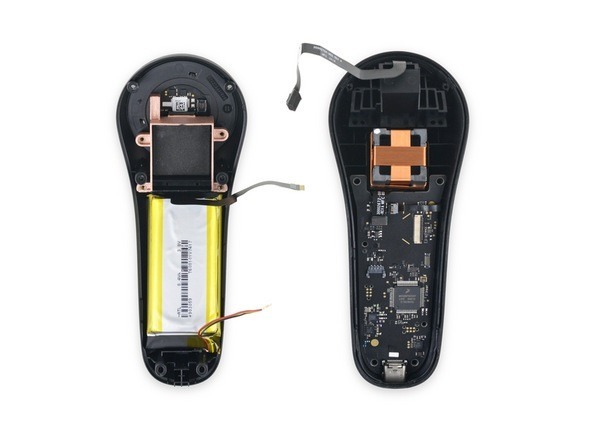 The controller is a lot simpler, as it houses an 8.4Wh battery, some copper shielding, and a trackpad with some LEDs (along with the circuit board which controls the whole thing). 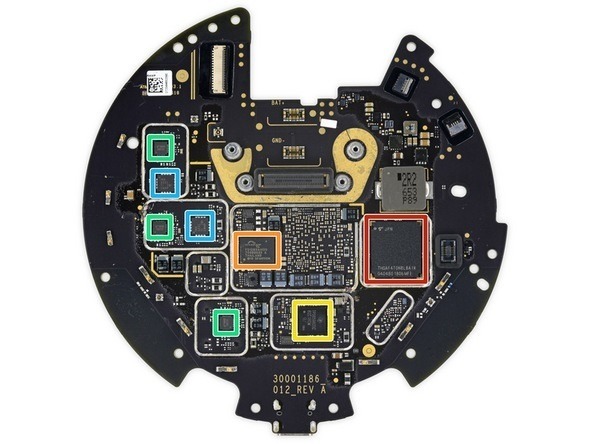 Taking apart the Lightpack reveals a cooling fan, the motherboard, and many chips which power the Magic Leap one. You have two Samsung K3RG5G50MM-FGCJ 32 Gb LPDDR4 DRAMs, a NVIDIA Tegra X2 “Parker” SoC, with NVIDIA Pascal GPU, a Maxim Semiconductor MAX77620M power management IC and Parade Technologies 8713A bidirectional USB 3.0 redriver, an Altera 10M08 MAX 10 field programmable gate array, a battery charger, a Nordic Semiconductor, and a Murata 1KL all stored in the front. At the back, you have a Spansion FS128S 128 Mb quad SPI NOR flash memory, a Texas Instruments TPS65982 USB Type-C and USB power delivery controller, a Texas Instruments INA3221 bi-directional voltage monitor, a UPI Semiconductor uP1666Q 2 phase buck controller, and finally a Toshiba THGAF4T0N8LBAIR 128 GB NAND universal flash storage. All of this is powered by a single twin-cell battery which runs at 3.83 V.
It’s a lot to take in for sure, but you can’t create virtual objects using the real world as a backdrop with only a few parts. 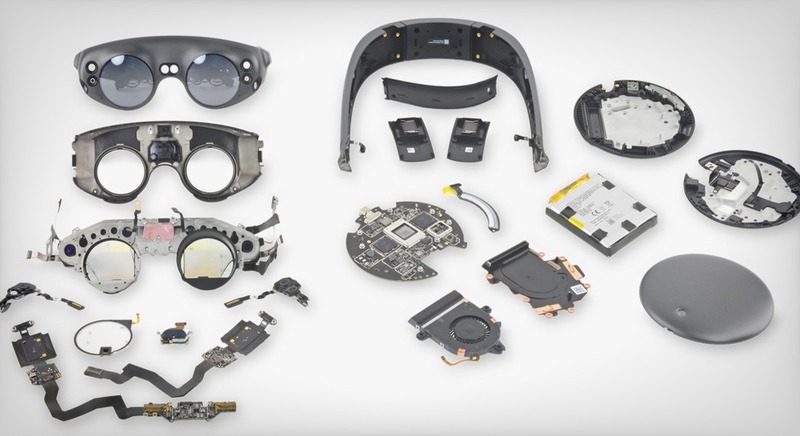 IFixit’s teardown of the Magic Leap One gets more technical—of course, going so far as to see how repairable the headset is. 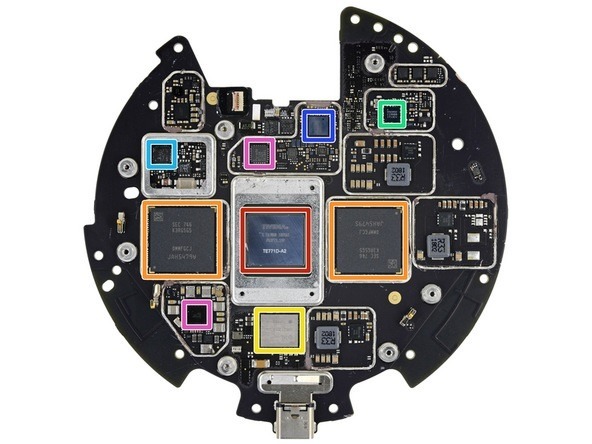 Find out more over at iFixit .